You don’t need to be the sharpest tool in the box to realise how racist Egypt is, or how little the discourse of rights relating to race is embraced. I have not previously written about this because it is one of the very few things that make me ashamed to be a human being. 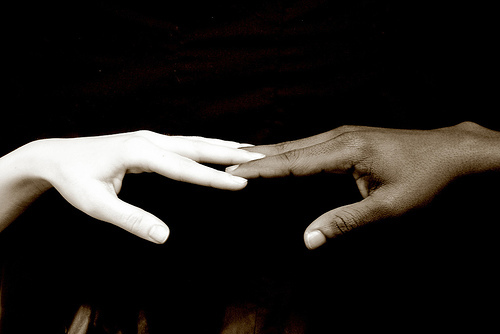 Racism: an irrational, innate belief in superiority in oneself over another based on skin pigmentation. I remember a Jamaican friend of mine in London in 2002 telling me that Egypt was the most beautiful country she’d ever been to, but that she would never go again because of how racist they were. I was shocked. Egypt? Racist? I thought that this girl must have just been very unlucky and had met one person who had said something about her beautiful colour and she’d taken it to heart. But Egypt, my favourite little fruit of Africa, surrounded by all my black brothers and sisters could never, yes never, be racist. Ten years later, however, I am sat in my balcony in Egypt typing this blog fuelled by my rage and disappointment not just because Egypt is, in fact, racist, but at the extent of this racism. I went to find a quite spot in City Stars today, some café to write up my field notes – I am here in Egypt doing my PhD and doing some work with Street Kids in the meantime. Anyway, so I walked in to City Stars, minutes before they opened for the day. I had a quick chat with a black cleaner outside about the weather and about what a shame it was the person who had discovered air conditioning had not won some world-recognised prize. I then walked into Spinney’s (supermarket) and chatted to the three black cleaning staff about how empty the stores were early in the morning. I had just met four black people. That in it’s own right was strange for Nasr City. Nothing struck me as strange because just as many – and more – white(r) cleaning staff was around. I found my way to Cilantro and settled in. A group of ladies arrived at a nearby table. Again, I only noticed the black girl between them when I realised that when the food came, all the white women started to eat and she was standing with the baby by the door so that his moaning didn’t disturb them while they ate. I sat by the door that Mary was stood by, and we started to speak. We had a pleasant exchange, found out she was an Ethiopian refugee and that she would eat later at home because she didn’t want her employers to spend money on rich food like the food they served here. I decided to pack my work up and do some other type of research. I walked into 35 shops. I found no black sales assistants. No black management. But during my walk from shop to shop, I met 6 more black cleaners. Why was there no racial equality in the division of the labour available to them? Was it purely a coincidence that the 9 black people I met today lacked the competencies to make them anything other than cleaners and maids? Let me make something totally clear. I have no qualms or issues with cleaning as a job. Be a cleaner, it’s a wonderful job that makes a lot of people’s experience of the world more pleasant. But why was the Nubian graduate of commerce sweeping the floor this morning? Why was Mary from Ethiopia, the law graduate a nanny to the Egyptian elite? Why were Sudanese men famous for being the average mans porter in Egypt? Why were the Nigerian women made to dress in white so you could segregate them as nannies and away from the elite in sports clubs? Why don’t I walk in to the clothes and accessories stores in City Stars and see black sales assistants? Why have I never walked into a hospital to be examined by a black doctor? Or shaken hands with a black engineer at Rehab? Or had my nails done by an African? It seems true, then, that it is the new stamp of status, class, and wealth to employ a black porter to open your door or a black maid to run errands during the day in the city’s scorching sun. We are a nation that will not embrace the minorities or afford them equal opportunities. Every time, and without exception, when I show my wedding pictures to my family or friends in Egypt, someone must feel the urge to make some comment about pictures of my black friends in their superb coloured clothes. How many of you in Egypt been around a new-born and everyone in it’s family, the first things they are saying are around an examination of how white and beautiful, or black and ugly the baby is. And everyone laughs! What are they laughing at? That child, if the slightest bit dark skinned is doomed to a life of nasty comments from the family of why she/he were so unlucky they didn’t take after their fairer mum/dad. My religious education class over. It needn’t even be a matter of religiosity. It is a humanitarian question. We are equal in Egypt in terms of the injustice the past and current regimes are subjecting us to. Yet it seems we are following the theory that suggests the oppressed become oppressors. And being oppressed by our governments we are turning to the weaker, the poorer and even turning to the equal but different to practice that oppression on. It is so deeply rooted though. I switched the TV on once (this is always a very rare occasion for I hate the box set), and stood to watch in horror an advert for a product called “Fair and Lovely” that apparently, if applied twice a day over the period of a month, lightens your skin up to seven shades and apparently, as a result you are more beautiful and happier. I felt an acute need to throw up after watching this ad. I remembered reading a study of the poor in Egypt who do all sorts of horrible things to get money to afford skin brightening, lightening creams in hope to become more attractive and have higher chances of finding a husband. The street kids I work with are mostly dark skinned children. There are two babies born to street mothers that are the favourites. It is no coincidence that they are the lighter skinned babies. They are bought out and shown to the ambassador’s wives when they visit, they get to wear the newer of the hand me down clothes that are donated and they are hugged and wooed the most. Does it not strike anyone that there are no fair skinned street kids? What is that saying about poverty and violence, abandonment and assault directed at the darker skinned kids? Why are they running away while the fairer skinned kids are resilient to poverty, able to deflect violence because they’re too cute to be beaten. These are the stories coming out of the shelters. It’s the elephant in the room. It’s the story that’s easier to dismiss. It’s the feelings that are uncomfortable to deal with. One day, an old lady hit me with her handbag on the bus in London when I sat next to her. She called me a bloody foreigner. I’ve lived in London 32 years – that’s all my life – and that was the 3rd racist comment that was directed at me. Are there racists in London? Of course there are. But I want to bring my kids up in London because I want them to see a Black, White, Asian, Caucasian, Chinese cleaner, sales assistant, doctor, plumber, teacher. I want them to play in the park and take a picture like the one my best friend Dina sent me of her kids on a merry go round with almost every race represented in the faces of the children. Do the majority of black people have chips on their shoulders? Of course they do. Just like the Christians and the poor. The “majority” has peeled that potato and have placed that chip nice and firmly on every shoulder so that at the slightest look or gesture they take offence. I’ll know this uprising has hope of becoming a revolution when I see companies take pride in recruiting minorities. Till then, here’s to all the amazing black people I know, thank you for teaching me how to deal with my afro hair and just for being a standard part of my life. Race is an capricious label that has no legitimacy. This is in many ways quite an odd topic to discuss as Arabs are not usually seen to the wider world as being racist. But as Arabs belonging to and knowing this community. We know straight out that whiteness is preffered and that the paler you are the more beautiful you are. You can be white simply because you are beautiful when you are not really beautiful at all in a classic sense. My family is partially Nubian from my mothers side so we have an array of colours from her side of the family. It’s still clear though that the fairer members of the family are regarded as the most beautiful. Even if one of the darkens ones is actually prettier it’s seen as a shame her darkness got in the way of her prettiness type attitude. If only she were white she would have been the fairest of them all. Now crucially. This experience is all between Egyptians, different shades same nationality. My experience of Egyptian racism towards black Africans was the real eye opener. Both my sister in laws are married to darker men. One sudanese (which somehow makes it slightly more ok because he’s Arab) and one ghanian. Both of my sister in laws were raised in London, so they married for love and respect and compatibility with a shared religion and outlook on life. Not for colour. But the community around them think these marriages were a mistake. The beauty of white is so ingrained most of these Egyptian aunties and uncles can understand the attraction to begins with ” how can u find him attractive? Maybe he treats her very well, maybe she really loves him” but find him attractive, like you dig that look? No way! Then come the children, with the Afro hair, mixed features, some siblings more black and African looking than others and things get messy. The comments are not about what is attractive about each child but which child managed to escape those black genes and come out looking more Egyptian. All classes in Egypt have these beliefs but it is the elite, who are the most vocal of these opinions, and their children betray these beliefs more than their eyes do. Comments like f off back to Africa, or you spent too long in the oven, or your so ugly, picking a fight because of colour, or simply withholding affection or a natural want to join in play shows that the mother harbours the same attitude and has passed these emotions on to her child, to such an extent that it has changed the basic and natural enter actions of their child with others of a different colour. Never the white European children though, always the black, dark child. Thank you Sally for sharing your own familial experience with the readers. I tried to keep away from stories like the one you mentioned so that everyone could relate and read on to the rest of the article. I was hoping that someone would then go on to illustrate those points like you so sensitively did, in the comments and I am glad you shared this, because to those examples you wrote, I know a lot of my own friends would relate. We have a long way to go in Egypt to accepting, let alone celebrating, anything that is different and it is a crime, in my opinion, to deprive our children of that richness that comes with engaging in diversity. I read both article and comment and there is nothing much I could add except that it is about time this issue is being raised. Although not an issue on the surface and in bright daylight, I do get the notion this taboo subject is about to explode rather sooner then later. Still, a fair skinned egyptian girl can marry a man with darker skin as long as they live abroad. At least, so it seems. Living in Egypt becomes a different issue when being faced with behind the hand slander and a polite smile in your face. We as adults believe that we can handle the pressure of society, even being passed up twice for a senior position because “wife is from Ghana”. But it is really about our kids that frequently bear the consequences. How to handle that situation should be a subject I am looking forward reading from you, Nelly. Thank you very much for taking the time to read, comment and share your own personal experience. I salute you for facing the racism in Egypt head on and marrying the girl wanted regardless of the comments that I can only imagine were made. I would not worry about the children. They have been given a chance to embrace humanity at a higher level than to be cornered in the familiar. This is something that will take years to learn. I feel sad to say this, but our religious teachers have a big part of the blame on their shoulders. All Friday khotab are laden with some form of hatred towards Jews, towards foreigners towards anyone different. Hatred will beget hatred and until we start looking at humans as individuals and stop this urge to group them, then we are still a long way away. Thank you again for sharing and your time and I hope I will be able to bring my children up to not even notice the colour of skin of the child they are sat next to. Thanks Nelly for bringing up this touchy issue. You are absolutely right – there is a serious vein of racism that runs in the Egyptian community. The main problem is that the problem is sanctioned. It isn’t addressed as a troubling issue. It was especially prevalent in older generations (as in my grandmother’s) but has slowly been eroding with younger generations I think. But you are absolutely right about how skin colour is such a big issue. And the most ironic thing about it is we Egyptians aren’t even white! We are dark-skinned! The majority of us are and yet we can’t accept who we are, let alone others, and work so hard to change this. I saw the TV as you mentioned (there’s more than one actually) and it always struck me that it isn’t just saying “be whiter to be prettier” – the ad is tailored to the idea that “be whiter so you have better opportunities in life”. One ad is about a girl who wants to work as a TV anchor but can’t but lands the perfect job after using the whitening cream, another is about getting married, etc. My experience with jobs for black people is slightly different from yours. I have seen dark-skinned people in high paying jobs. I’ve seen Nubians doing very well. They aren’t the majority, granted, but they are there. But I’m not sure if it is about racial labour segregation or about potential. As a poor country, the only people who actually emigrate to her are those from even poorer places. Usually, these people may not have the required skill set to land higher-paying jobs so settle for what they can get. The problem is how badly they are treated because they are dark-skinned. If a tall, African woman for example gets on the underground you will hear all the other women snickering and making sick jokes about her and won’t even care to hide it, thinking she doesn’t understand Arabic so it’s ok. It’s horrible and sick but people do it because they were raised up to see their families do it, were never taught otherwise, and there are no awareness campaigns or laws that protect against that. Finally, I think a strong angle of it is the false superiority complex Egyptians as a nation have. The whole idea of what a great nation we are (which went down the drain during the Mubarak era) runs contradictory to our current place in the Arab world. We aren’t the “leading force” anymore, we aren’t the biggest player etc. But people just need to feel superior so take it out on those who are weaker or less fortunate, ie African emigrants. After all, if they come HERE then they must be really desperate right? It’s sad – but I think we can all start with awareness in our circles. There’s change happening, I’m sure of it, but it is too slow. We need to accelerate that and get people to understand the beauty in the diversity of colours, creeds, and thoughts. A thoughtful and beautiful commentary – thank you for taking the time to write it. I agree with you – If they knew better, they would do better. I think what really angered me is that the media is so blatantly racist that it kills much of the little effort that is being made to change expressed racism. The producers of both the product and the ad should be charged with racism and hate speech. And that’s the other frustration – people totally not getting what free speech is about, tell someone not to make racist jokes and they tell you “in a democracy… bla bla bla” like we saw on that post with the boys commenting that they don’t want to see Hijabi’s in tight jeans. You make excellent observations about Egyptians themselves not being white and have you heard the whiter ones always tell you it’s the “turks” in them?? We have a long way to go, but I think just starting to speak and write and talk about it is the right way. Ignoring it like it doesn’t exist has proven the wrong way forward. i think u r trying to make an issue from nothing , it seems that u r an egyptian bel beta2a , u dont know anything about real people of egypt , racist people u r talking about even if they exisct , they r a minority that prove nothing,, u dont see many black people in egypt cause they r minority, and it’s not right that they didnt work except in dirty jobs as u try to convince us,, such silly article !! I think one of the biggest problems in Egypt is people who try to put across their opinion rudely and with disrespect. Unfortunately, as soon as you speak to people the way you have written, you automatically lose it’s validity, even if it was worth considering. I am sorry you cannot enter a civil conversation. You may have had a point, however, your articulation of that point does not warrant engaging in a debate over it. sorry i have to comment on this! dark Egyptians are not really a minority.. most of the black egyptians come from Aswan, Saeed, luxor ect and that is a large community. the fact that you dont acknowledge that there is racism shows how ignorant you actually are as a person.. I am a black egyptian born and breed in London and the first time i ever experienced racism was in egypt. Not only was it a shock but it emotionally had me confused for many years.. i didnt understand how i can feel so self concious in my own home land but so safe in London. But let’s not go so far, most egyptian movies up until 2000 would have at least 2 racist jokes in them. There were many a times i would go to the cinema in cairo and a joke would be told about the black women/man on screen and the whole cinema would roar with laughter whilst i withered in my seat with embarrassment and confusion. 2 years ago i brought a couple of friends with me to egypt as i really wanted to show them the mystical city of cairo. 2 where black, one white and one half indian half italian.. that was the worst mistake i could have made! every step of the way i had to explain to my friends why they were having people say things like ‘ya chocalata’ and ‘why has the light gone out’! our home is in new maadi in cairo and i watch how the very dark Sudanese get treated and cussed out with on one occasion my WHITE friend having to help protect a mother and her child against a group of young boys throwing rubbish at them simply because they where black and it was ‘funny’.. My friend then turned to them and said, but you are black yourself.. she showed them her arm and said I AM WHITE, you are NOT! they felt so embarrased at being confronted by a white women telling them that they themselves are the colour they look so down apon that they walked away without much fight. Great piece..you should have it translated to Arabic and published in mainstream media in Egypt. It’s an extremely urgent issue and awareness must be raised,. its a multi factorial thing …. and i dont think most of us have that look of the black being part of that slavery thing .. bec its not part of our history ..